For those vegans who miss duck-meat, there’s a great substitute that soaks up flavour and creates an incredible mock duck taste. 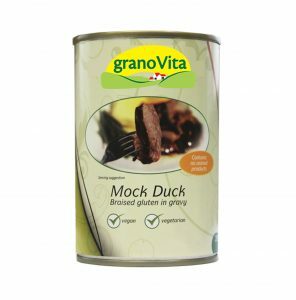 granoVita have perfected a delicious way to enjoy the taste of duck meat without any animal products or animal cruelty. Braised gluten seitan is completely vegan-friendly and does a great job replicating duck meat – right down to the meaty texture. The unmistakable taste and texture are both still there; helping you whip up a truly mouth-watering curry that will fool even the most steadfast meat-eater. We’ve got a terrific recipe below from granoVita that uses a tin of tasty mock duck meat in gravy that’s quick, easy and simply delicious. First, heat your oil in a pan with a heavy-base and fry your chopped onions for 2 minutes. Mix in the pureed ginger and garlic add fry for an added 2 minutes. After that, add your tomato puree and chopped tomatoes and heat through. Mix together your dry spices with 30ml of water to make a paste and then add into the pan. Next, add your tin of granoVita mock duck and stir-fry for 3-4 minutes. Mix in the remainder of the water and reduce heat to low and simmer for 10 minutes. Did you have a go at making this recipe? Let us know down below in the comments.